On Monday August 4th 2014, the U.S. Embassy Belize hosted Deputy Assistant Secretary of State for the Bureau of International Narcotics and Law Enforcement Affairs (INL) Luis Arreaga during his visit to Belize. Mr. Arreaga spent two days in Belize, visiting Belize City and Belmopan on the first day, and the second in San Ignacio and Benque Viejo. His visit also includes a trip through Guatemala. 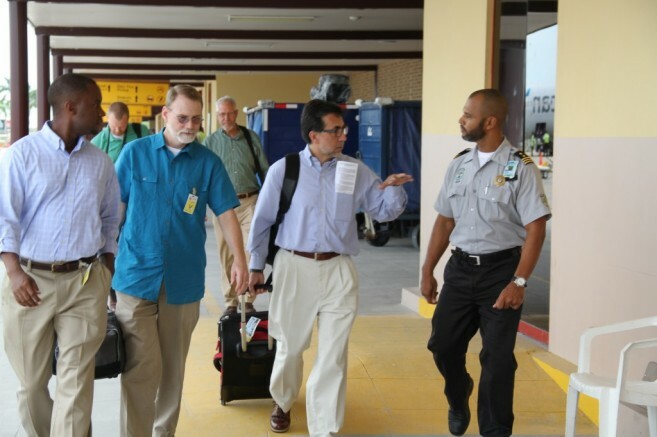 Mr. Arreaga was greeted by Embassy staff on the tarmac at Phillip S.W. Goldson International Airport, where he toured immigration and customs equipment funded by the United States. After the airport, the group drove to Belize City, where Mr. Arreaga took a short tour of gang areas followed by a visit to the Gang Resistance Education and Training program at St. John Vianney School. Mr. Arreaga toured each classroom, speaking to instructors and students. Funded by the Central America Regional Security Initiative (CARSI), the G.R.E.A.T summer program is a two week long educational experience, encompassing classroom instruction, athletics, art expression and two field trips. The program educates Belizean youth about the dangers of gang association and violence. Mr. Arreaga then visited the Queen Street Police Station and was shown the improved methods the police have implemented to electronically log arrests and other crime information using the Crime Information Management System (CIMS), also funded by CARSI. Senior Superintendent, Dezerie Phillips, Commander Suzette Anderson and other officials discussed the improvements being made with the help of CARSI funds in areas such as technology, Scenes of Crime, and forensics and ballistics analysis. On Tuesday Mr. Arreaga visited the National Security Ministry where he met with CEO George Lovell. Later he met with San Ignacio Police Officials and members of the Cayo Neighborhood Watch Association and People’s Coalition. Along the way to the Belize Western Border, he witnessed the Mobile Interdiction Team (MIT) in action at a check point. Before departing Belize for Guatemala Mr. Arreaga met with Customs, Immigration, and Border Management Agency officials. Through CARSI, the United States is assisting Central American governments in their efforts to fight violent crime and improved citizen security. CARSI programs enable Central American governments to weaken the influence and violence of gangs, organized crime, and narcotics. The United States, through CARSI, is committed to implementing sustainable, high-impact programs in law enforcement training and professionalization, anti-gang activities, equipping police and security forces, sharing information within the region for the investigation and disruption of criminal activities, and assisting in the interdiction of narcotics, firearms, bulk cash, and smuggling. INL aims to continue funding gang prevention programs through CARSI and supplying up–to-date police equipment and training to prevent violent crime and narcotics distribution while upholding citizen security and the rule of law. SPSUN helps relocate a wild boa constrictor!